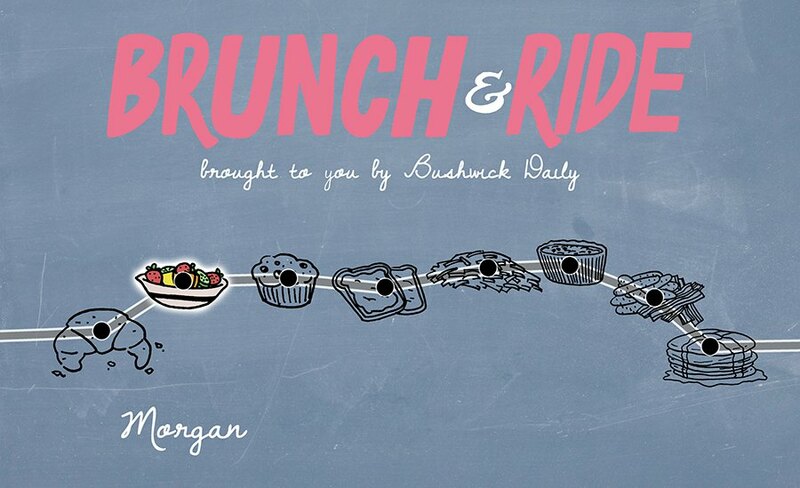 Yes, we all know that Morgan is the stop for the game-changing and Girls-approved brunch at Roberta’s, but what happens when the line is too long and they run out of sticky buns? 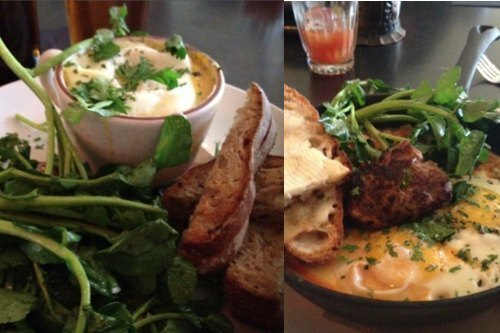 Luckily, there are a number of other delicious brunch spots nearby that let you have your organic, humanely farmed eggs and eat them, too. Here’s the rundown on four taste bud-pleasing options. After hitting up one of Tutu’s late-night dance basement parties, the only remedy to next morning’s hangover is their country style brunch. The semi-recently opened spot (but what’s really "recently" in ever-changing Bushwick?) makes you feel like you’re dining in your grandma’s farmhouse, an apt vibe considering it’s named after one of the owner’s grandmothers (“tutu” is Hawaiian for grandmother). With knickknacks decorating the bar and a wall of antique portraits of country stars and cowboys, you can start the morning dining under the gaze of Dolly Parton, who we’re pretty sure would approve of the countrified $15 brunch special of an entrée, Bloody Mary or Mimosa, and coffee and tea. While you may hear Jay-Z pumping through the speakers, your meal is more deep south than heart of Brooklyn. 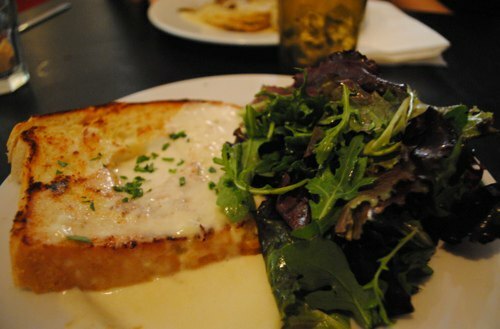 Along with cider doughnuts and goat cheese and kale omelets, you’ll find below-the-Mason-Dixon line staples like creamy cheddar grits topped with two perfectly poached eggs and crispy kale, or the plate-sized buttermilk biscuit that is somehow both flaky and dense, even after it’s dipped in a rich mushroom or sausage gravy. This is food that’ll line your stomach for the long day ahead of you – meaning that the closest you’ll get to yogurt and fruit is the seasonal fruit on top of the Belgian waffle. Anglophiles can breathe a sigh of relief thanks to this “English country kitchen” making a name for itself on Wilson Avenue. With a menu inspired by Britain and the decor to match (think antique birdcages hanging from the ceilings and large paintings of damsels in distress, old guys with an aura of royalty, and horses in the English countryside), Dear Bushwick creates a warm, inviting vibe that's perfect for the somewhat tiny space. While it pays homage to Britain, it lacks the typical stiffness (unfairly) associated with our friends across the pond. Thanks to the neighborhood vibe, you’ll feel equally comfortable grabbing a seat at one of the closely spaced tables or claiming a spot at the bar to chat with one of the friendly bartenders as you dig into the hearty morning fare. Now, let’s talk about the food. One of their most popular and delicious brunch dishes is the shirred egg baked with navy beans and garlic and served with squares (or what they call soldiers) of cheesy bread ($9), but they also serve the traditional “Full English,” a breakfast of eggs, meat, greens, beans, stewed tomatoes and toast ($15). Many of the dishes can be adapted for vegetarians and vegans, a must considering their young, tattooed, and socially conscious clientele. The Bloody Mary’s are made with marmite mix (and English staple) for a deep, rich flavor. But don’t ignore their amazing cocktail list, highlighted by drinks like the Banbury Cross, a mix of rose-infused gin and homemade ginger ale ($8). Plus, in the next month or so, they’ll be opening their back patio, so you can finally start dining outside in proper summer fashion. Ideal Meal: Order the creamy shirred eggs ($9) for you and the sweet and sticky Yorkshire pudding pancake ($8) for your “friend” (who may or may not show up to share it). If you have room, add a dark beer biscuit with cheddar ($3) to fully round out your meal. Formerly known as the (legendary) Life Café, this new incarnation lives up to its name, offering a comfortable, welcoming atmosphere that aims to provide a home away for home for residents of our newly expanding neighborhood. While there aren't any couches or shag rugs found in the typical living rooms of our childhoods, there is a lot of booze and a big screen TV behind the bar, playing whatever’s on, whether its “The Bodyguard” or a ballgame. The wide open space is full of light and along with shelves of books, they display work from local artists on the light blue walls. Stocked with options for vegetarians and vegans, the brunch menu is separated into six sections: Freshness (fruit and yogurt), Classics (eggs, scrambles, and sandwiches), The Spice (Mexican-influenced), Salads (cobbs, Caesars, and quinoa), The Indulgent (pancakes and their ilk), and 983 Burgers (both beef and veggie). Bloody Mary’s ($5) come three ways (original, Cajun, and pickled) and as Manny’s ($10), which just means that they’re bigger than normal. This popular spot can get pretty busy, but the bar is large enough to fit those not able to get a table and the bartenders are friendly and attentive. Just remember this isn't actually your living room, so don't come in your fuzzy slippers and pajamas. Or do, they probably wouldn't care. 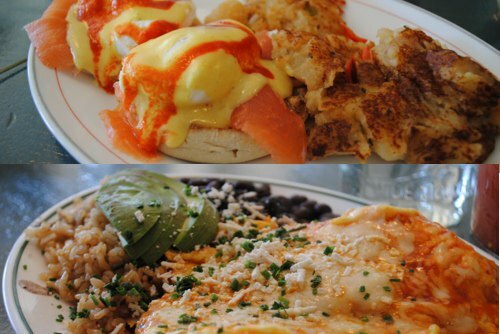 Ideal Meal: The "Huevos Rancheros" ($8) are awesome and, of the three versions of eggs Benedict ($9), the smoked salmon and sriracha hollandaise-topped “Sea” version are our fave. #4: Mama Joy's: Fried chicken for breakfast? Sure! Bringing a little more Southern flavor to Bushwick, Mama Joy’s low-key, locally sourced cooking matches the joint’s old fashioned, diner-like vibe that’s more reminiscent of a Nashville dive than a raved-about Brooklyn gastropub. Using their Southern roots as inspiration, owners Chad and Laura Hensel named the place after Laura’s grandmother, a hostessing wiz who was famous in her small town for her entertaining skills. These modest origins can be seen in the wide-open, artfully run-down interior, complete with vinyl bar stools, exposed brick and wood walls, and chairs reminiscent of the ones you sat in during high school math. 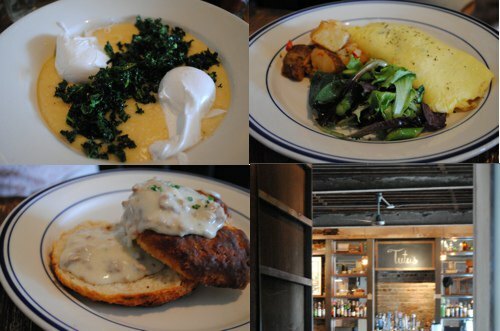 Fortunately, the brunch menu doesn’t retain that same modesty, thanks to dishes like the buttermilk biscuits with gravy and duck confit ($12), egg in a hole with gooey melted cheese ($8), and pork belly with eggs ($9). Their famous fried chicken is often on the seasonally changing menu, but be sure to arrive early on the weekends since it goes fast. While a Bloody Mary is the traditional morning drink, you’ll find more satisfaction ordering one of their gin-based cocktails, craft beers, or a drink made with the many American whiskeys behind the bar. Ideal Meal: If the fried chicken isn't available (or a bit too heavy for the a.m), stick to southern fare, like buttermilk biscuits with gravy and duck confit or, for die-hard carnivores, the pork belly with eggs.